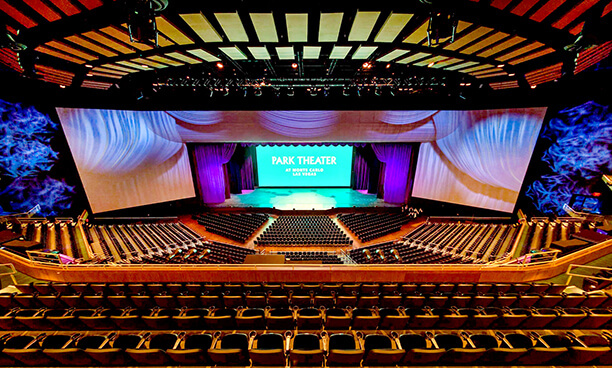 The $550 million dollar transformation of The Park Theater brings high-end style entertainment to Las Vegas and specifically the Monte Carlo Hotel on the Strip. It hosts some of the biggest names in the entertainment industry, which included Stevie Nicks and the Pretenders during the venue’s opening last December 2017. Bruno Mars, Gwen Stefani, Cher, Ricky Martin, Britney Spears, Chris Rock, and many others are among those who have already performed there, or will be performing there. If your project calls for stadium seating, call us today to discuss how we can help you save time and money. We have extensive experience in the cinema and entertainment industries and would be happy to provide an initial consultation based on your project. Many theater owners across the U.S. want to construct new or retrofitted auditoriums, with over 15 years of experience, we can help you get started. Along with experience in stadium seating risers, we also have an expansive network of Architects and General Contractors that can assist you in your next project. SSE is the leading designer and provider of permanent, pre-engineered stadium seating systems for cinema, education, corporate training and worship facilities in the world. 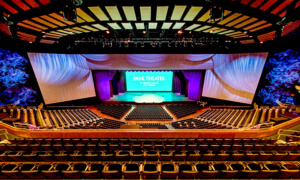 Stadium Seating Enterprises, Inc. (SSE) is the world’s leading provider of prefabricated stadium seating systems for the Cinema, Worship, Performing Arts and Education/Training market segments. SSE’s client base represents the largest Cinema operators in the world, tiered seating for some of the largest Churches in the US and Educational/Training facilities for many universities, colleges, secondary schools and select Corporate clients from coast to coast. We offer systems specifically designed for new construction and ones that are specific to renovation/retrofit projects. 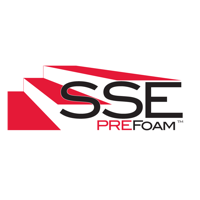 Our standard PREFOAM™ System and our PREFOAM DryFit™ Systems have been fully engineered to meet the requirements of virtually any project requiring tiered stadium seating. SSE works directly with end users, architects, engineers and contractors to design and manufacture a prefabricated “kit of parts” for stadium seating. SSE operates with regional manufacturing partners in six geographic zones within North America to facilitate responsive and competitively prices products and services. The PREFOAM System consists of EPS Geofoam blocks for structural support and a steel forming system that allows for a fast and easy assembly and a strong forming system for concrete topping material. The PRERFOAM DryFit System also utilized EPS Geofoam blocks for the structural support, but is based on a proprietary design for a plywood or cement board facing materials. The DryFit system is ideal for luxury cinema retrofits due to its light weight and ease of assembly without having to introduce a wet trade like concrete into the auditorium. Working directly with the design and construction teams, we design, fabricate and deliver the selected system to the jobsite for installation by others in a timely and efficient manner. SSE has a proven track record of success with more than 300 individual clients in 46 states, Canada, Latin America and the UK. Our team has put more than 81.75 Million Cubic Feet of EPS Geofoam in place since 2002 in more than 1850 completed auditoriums. The quality of our services and products is exemplified by the number of repeat clients we have over the years. We believe the key elements that set us apart from any of the competition are: Our high quality, innovative and reliable PREFOAM products, our willingness and ability to collaborate with the design and construction team members to insure customers are getting the best value for the money, and the outstanding professional relationships we have developed over the past thirteen years with our manufacturing and supplier partners. But more than anything, it is the absolute commitment to the best customer service in the industry that puts SSE “heads and shoulders” above the competition. SSE is a design and fabrication partner on construction projects. TEAM BUILDING: We have contacts and relationships with architects, consultants, contractors and installers nationwide and we are anxious to help you structure the most capable and responsive team to meet your needs and requirements.